The Prompt: The holiday season: can’t get enough of it, or can’t wait for it all to be over already? Has your attitude toward the end-of-year holidays changed over the years? I can’t get enough of any holiday, no matter how much it is commercialized. The world evolves. Whether we agree with the way it does so or not, the only thing we do have control over is our attitude, so I simply celebrate every holiday the way I want to celebrate it. This year, I’m at the beach for Christmas. 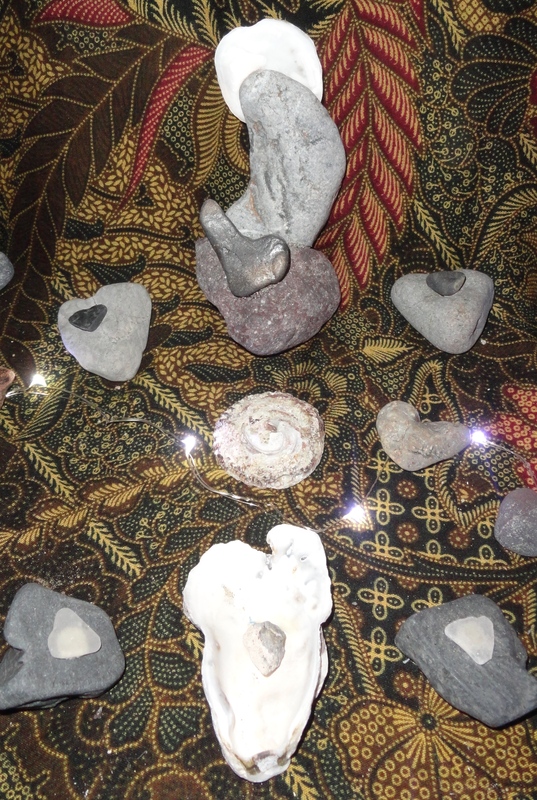 For the past month, I’ve been collecting wonderful finds on the beach and putting together an altar that is comprised of a palm fruiting stem, flowers I’ve made out of egg cartons and all of the heart-shaped rocks that seem to have cropped up more frequently than ever before. 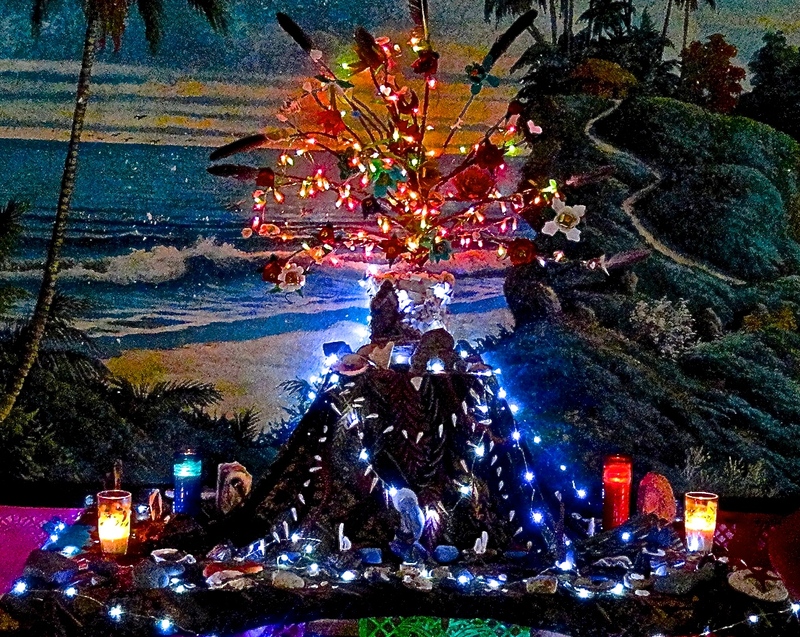 I now have 60 or more of them that decorate both the fruiting stem “tree” and the altar around it. Then, I started seeing rocks in the shape of characters from a nativity Creche and constructed 15 creches which may be seen on my facebook page. You can connect with it here. Contrary to what you might think from these pictures, I am not religious. I do hope that something exists outside of our physical realm, but I don’t comprehend exactly what it is. We all find the beliefs that get us through our lives, and I love the Christmas story (be it fact or myth), the Xmas memories, communion with family and friends, the decorations and celebrations. 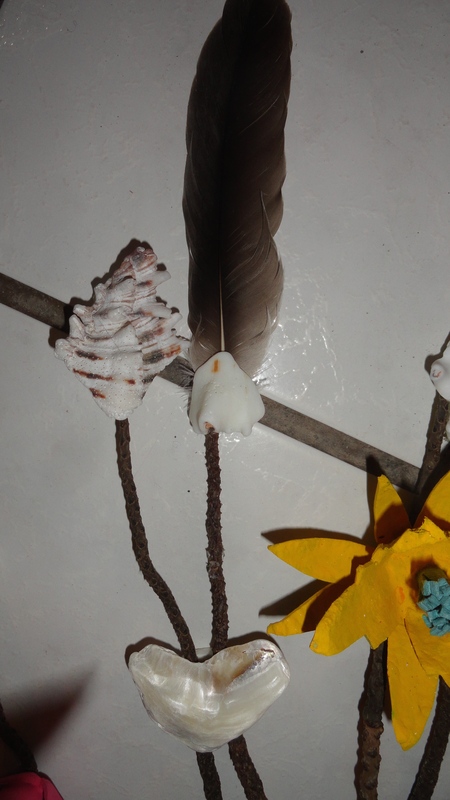 It started with a palm fruiting stem washed ashore. 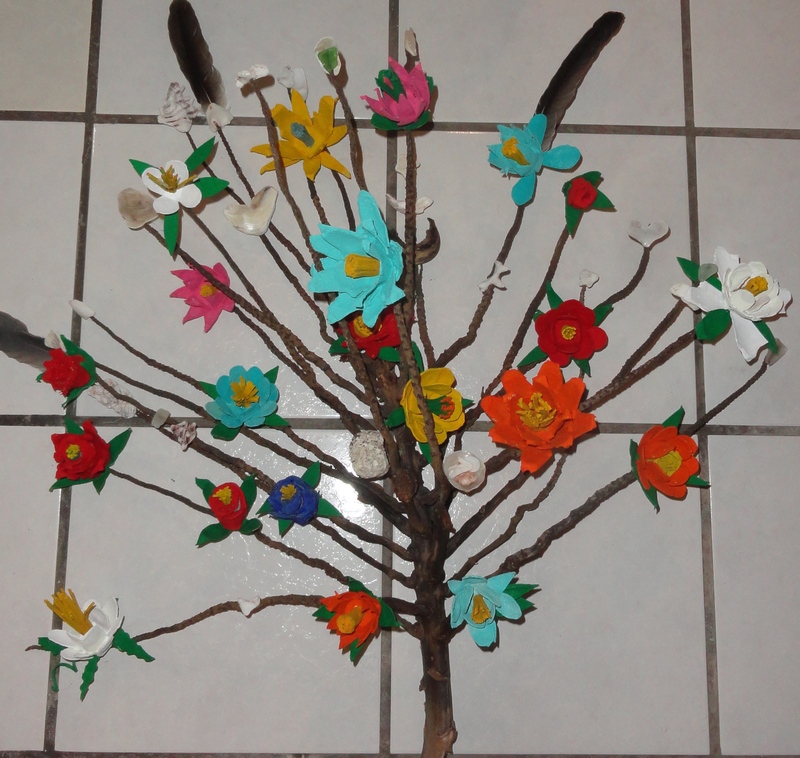 I added flowers I made of cutouts from egg cartons, painted and glued together, then added pelican feathers and various heart-shaped shells and small stones found on beach walks. 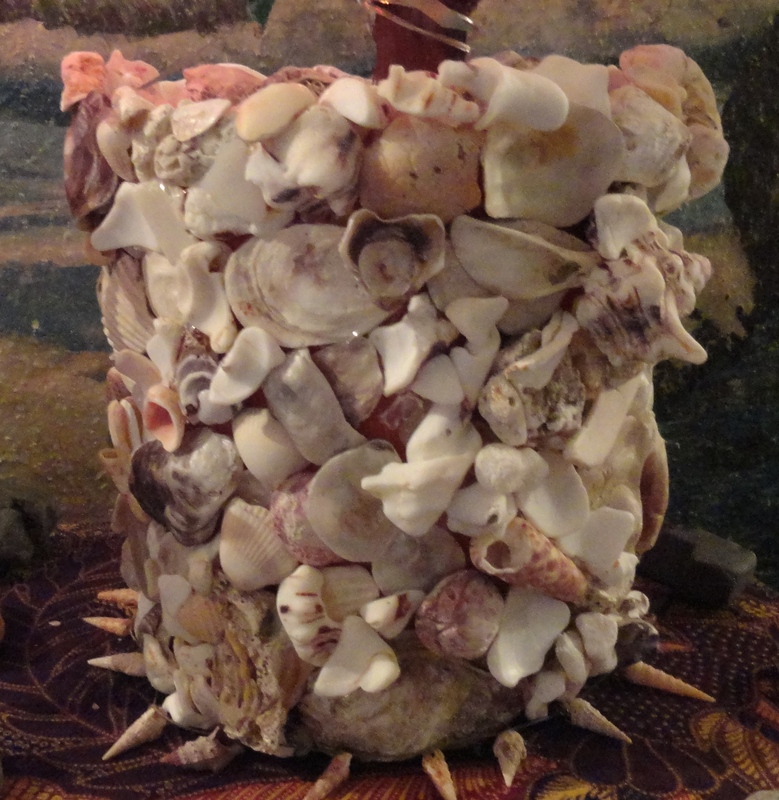 I then covered a flowerpot with shell finds and cemented the “tree” into it. Although I wanted the tree to be all natural, I quickly decided an Xmas tree without lights was not going to be enough! The mural behind the tree came with the rental house! I’ve started sleeping on the futon in the living room to enjoy the tree by light strings and candlelight. 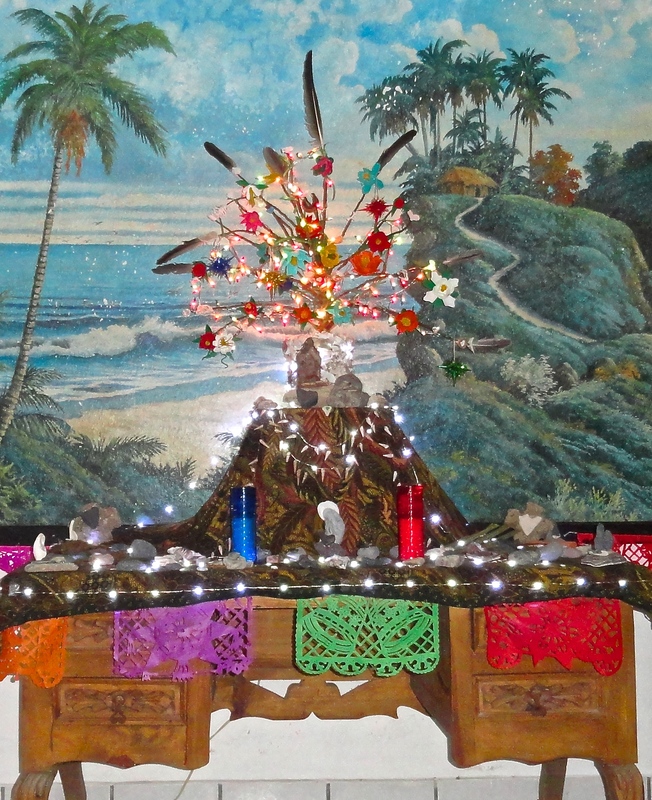 This entry was posted in Beach Christma, Christmas, Christmas Tree and tagged art, Beach Christmas, Beauty, Christmas, Christmas Tree, Christmas Trees, Daily Post, Daily Prompt, Judy Dykstra-Brown, Judy Dykstra-Brown Photos, Judy Dykstra-Brown Poems, The Daily Post, The Daily Prompt on December 19, 2014 by lifelessons.